In the present study, creep activation energy for rupture was obtained as 221–348 kJ/mol for 22Cr15Ni3.5CuNbN due to the precipitation-hardening mechanism. The extrapolation strength of creep rupture time of 105 h at 923 K for 22Cr15Ni3.5CuNbN is more valid (83.71 MPa) predicted by the Manson–Haferd method, which is superior to other commercial heat-resistant steels. 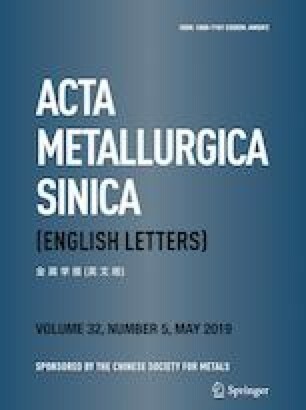 The tensile creep tests ranging from 180 to 240 MPa at 923 K were conducted to investigate creep deformation behavior of welded joint between a novel heat-resistant austenite steel 22Cr15Ni3.5CuNbN and ERNiCrCoMo-1 weld metal. Apparent stress exponent value of 6.54 was obtained, which indicated that the rate-controlled creep occurred in weldment during creep. A damage tolerance factor of 6.4 in the weldment illustrates that the microstructural degradation is the dominant creep damaging mechanism in the alloy. Meanwhile, the welded joints perform two types of deformation behavior with the variation in applied stress, which resulted from the different parts that govern the creep processing. Also, the morphology evolution of the fracture surfaces confirms the effects of stress level and stress state. This work was financially supported by the National Natural Science Foundation of China (Grant No. 51475326) and the Demonstration Project of National Marine Economic Innovation (No. BHSF2017-22). The authors also wish to acknowledge the supplier of the steel and welded joint: China Jiangsu Wujin Stainless Steel Pipe Group Co., Ltd.